Purpose and passion drive everything we do. Each action we take, each conversation we hold, each choice we do or do n ot make is based off how we feel at a given time about a particular subject. Passion gives us excitement–the deeper we feel about a subject, the more we want to learn about it and the more animated we become over it. Purpose pushes us to give our absolute best efforts towards achieving a goal. These two values are essential to people living fullfilled lives; only when we are passionate and have purpose in everything we do will be able to give everything we have–mentally, physically, spiritually, emotionally–to a positive end result. 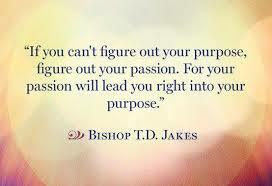 As for me, my passion is the written word and my purpose is to reach others through that language. I am a self-confessed bibliophile: my medium through which I hope to reach others with the written word is a book. Barnes and Noble is my favorite store–the dark paneling of the bookshelves, the walls upon walls of shelves, and the sight of book-lovers sitting in the Starbucks cafe reading their latest purchases all bring a smile to face. I can imagine nothing more satisfying than seeing a book I contributed to–through writing or editing work–come off the presses for publication. Through language we have the opportunity to educate, heal, inspire, inform, and bring laughter to others. Whether I am the one creating the content or preening the text before publication, I aspire to reach others through the crispest language possible.